audfprint is a (compiled) Matlab script that can take a list of soundfiles and create a database of landmarks, and then subsequently take one or more query audio files and match them against the previously-created database. This can be used e.g. to "de-duplicate" a collection of music. The fingerprint is robust to things like time skews, different encoding schemes, and even added noise. It can match small fragments of sound, down to 10 sec or less. This code is being distributed as a compiled Matlab binary, which requires the matching (freely-available) Matlab Runtime to be installed. The program has the same syntax and options whether called from the OS shell, or from the Matlab prompt. Note that development has ceased on this Matlab version; since 2014, I have instead been focusing on a Python-based version, also called audfprint. In this usage mode, a list of soundfiles is analyzed and written to a single database file. Various soundfile formats are supported, including wav, mp3 and aac. In the file below, reflist.txt consists of full paths to a number of soundfiles, which are then written to fpdbase.mat. (Note that in this case, the "filenames" in reflist are actually URLs, which can be loaded thanks to special functionality built in to mpg123; this won't work for other file types, and normally reflist would just contain regular file names). See the Usage section below for additional options. % -cleardbase, i.e., when initializing a new database. The command below matches a query soundfile against an existing database and returns the paths of the top 5 hits (paths as provided in the reflist.txt above). Each line of the main output consists of 5 fields: query-file-name hit-number hit-file-name matching-count match-time. matching-count gives the actual number of common, aligned fingerprints between query and hit; as a rough rule of thumb, more than 10 indicates a good match, although for very short queries even 4 or 5 matches is likely reliable. Where more than one hit is reported for a query (i.e. -nmatch > 1), they are reported in descending order of relevance, which means descending matching-count. match-time reports the delay, in seconds, between the start of the reference item and the start of the (aligned) query. Fingerprints can be a compact way to compare the alignment of otherwise matching audiofiles. For instance, in music mastered from magnetic tape, the speed at which the tape plays back is typically only stabilized to about 0.1%, so different digital masterings of the same music may easily differ by this amount - which can amount to a skew of 0.3 sec by the end of a 300 sec track. Also, different ripping software and different CD drives will very often introduce different-sized silent gaps at the start of tracks. Fingerprints can be used to compare such skews and offfsets, and audfprint even includes functionality to trim and resample your tracks to convert query audio into something that is more nearly aligned to the original reference item (which may not be available). % might want to use a shorter hop time for more precise timings. % by fractions of an analysis window implied by -oversamp 0. % alignoutdir is prepended to any path found. The fingerprinting works by finding local maxima in the spectrogram, then recording a "landmark" as the relationship between a pair of maxima. Each pair is encoded as the frequency of the first peak (from a 512-point FFT evaluated on a 11025 Hz sampled signal, so in units of 21.5 Hz, using 8 bits), the difference in frequency bins to the second peak (6 bits, since large jumps are not recorded), and the count of time frames between the two peaks (6 bits, in units of the 23.2 ms hop size). That gives a total of 20 bits, leading to a space of 2^20 = 1M distinct hashes. The hash table works by calculating all the landmarks for a given track, as well as the time at which they occur (the absolute time of the first peak, also in 23.2 ms units, used to check the consistency of the relative timing of landmarks and queries). Then the absolute time and the track ID (i.e. the sequence number of this track in building the database) are packed into a single 32 bit number and stored in the hash table at the address given by the 20 bit hash. (In fact, the number of buckets in the hash table is determined by -nhashbits; when this is smaller than 20, the 20 bit hashes are "mixed down" to the smaller space, with the effect that multiple hashes in the original space will be recorded in a single bucket). Each hash bucket has space to record up to 100 different tracks (controlled by -maxnentries); once that fills up, entries are dropped at random (which is normally OK since that track will be represented by other hashes too - missing any single hash won't prevent recognition). Since the hash table is stored in RAM, the default values need 2^20 buckets x 100 entries/bucket x 4 bytes/entry = 400 MB of RAM. You can increase the number of entries per bucket with -maxnentries, but make sure you have enough RAM to accommodate the larger table. You can also reduce the RAM footprint with a smaller -maxnentries. Because the absolute time and track ID are packed into a single 32 bit value, we have limited resolution for them. By default, the time value is stored up to 16384 (controlled by -timesize), i.e., 14 bits; beyond this, it wraps around, which introduces some additional ambiguity in the checking procedure, but is generally OK. With this default value, we are left with 32-14=18 bits to store the track ID, so the database is limited to 2^18=256k unique tracks; reference tracks beyond this limit will never be returned, but instead will be "aliased" to earlier entries. Reducing -timesize can increase the limit on the number of reference tracks; for instance, a -timesize of 256 (8 bits) would leave 24 bits for track ID, permitting 16M unique tracks to be remembered. Note, however, that at the default density of 7 hashes/sec, and a typical track of 200 s, we expect at least 1000 hashes per track, but the hash table can only record 2^20 x 100 = 100M distinct hashes, even assuming a nicely uniform distribution across the different hash values. Thus, beyond 100k tracks, we would anticipate a significant number of "dropped hashes" due to hash table buckets filling up, with a progressive impact on sensitivity. Increasing -density will improve the accuracy of matching, at the cost of slower processing and a larger hash table. You can also use a larger -density for the query than used when making the database; despite the mismatch, this usually results in more matching hashes. -oversamp 2 or -oversamp 4 attempts to oversample the query to generate extra hashes. The default of -oversamp 0 actually runs 4 separate queries, offsetting the query waveform by 1/4 of an analysis window each time, which is effective for overcoming problems with time window alignments. For very simple tasks, -userawcounts 1 will skip the filtering by consistent time skew and simply count the number of hashes in common between query and reference, regardless of timing. One distortion commonly encountered in replayed material is speed changes - tracks that are played back at a slightly different rate than the reference item, either due to miscalibration in analog-digital converters (commonly a few hundreds parts per million -- or less than one part in a thousand -- much less than can be perceived as a pitch shift, but enough to cause a drift of about a second per hour), or due to deliberate speed manipulations (e.g. to be able to play more tracks on a radio station by playing them all a bit faster). Speed changes can imact the fingerprinting two ways: if the time between two landmark events is changed by an altered timebase, then the quantized value of that time difference (which by default is in 23.2 ms units) may change, losing the hash match. At a stretch of 1 part per thousand, a time difference of 1 second (the middle of the range that can be represented by 6 bits) will change by 1 ms, which we'd only expect to alter 1% of hash values. 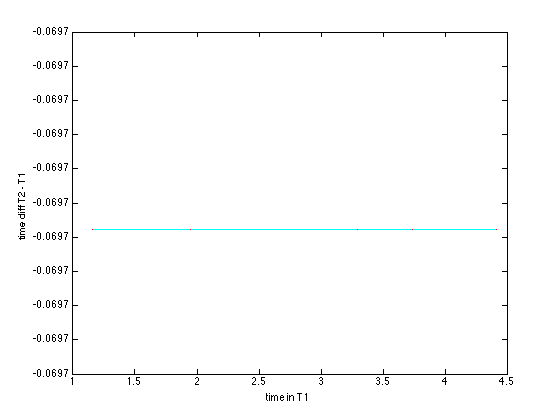 Another affect is on the spectrum itself; frequency values are also scaled by the sample rate error. Here, a 0.1% stretch of a peak at 1 kHz will shift it by 1 Hz, well within the 21.5 Hz bin width of our 512-point FFTs on 11025 Hz-sampled signals. Finally, time scaling will also affect the relative timing of hashes matched in query and reference: this can affect the final stage filtering of matching hashes by relative time lag. However, the quantization of this stage is quite coarse (1 second), so again a change of 0.1% should have little effect on short excerpts, although the effect will grow with the length of the query. This is for 225 sec query. Notice how the "Filtered" number starts to call even for a stretch of 1.0005 (0.05%, or 0.5 parts per thousand). This results from the final-stage filtering, where the stretch skews matches at the start of the track 0.1 sec relative to those at the end, so we begin to lose them; the individual hashes, as reflected in the "Raw match" column, don't start to drop until 1.002 (0.2% stretch), and are still substantial at 1%. The "Skew match" column (from the -matchalign option) actually estimates the time stretch, then counts how many of the raw matches are within two bins (64 ms) of this best time warp. It's smaller than the Filtered match for very small time warps, since it applies a stricter time window. But for larger skews, it compensates out the relative timing shift, so finds many more matches. Unfortunately, this match requires first estimating the time skew for each possible match, which cannot be done efficiently, so matching relies on the "Filtered match" column, which, by 1%, has fallen to chance-level matching. This does suggest, however, that a strategy of sorting by raw match counts, then estimating skews, then making the final decision based on the Skew match counts, would be more robust to time variations even out to 1%. In this example, for a database of about 1000 tracks, there were 6 tracks with Filtered counts of three or more to the 1%-skewed track, and it was basically luck that the true match was among them. However, using raw counts, there were 4 tracks with more than 100 hashes in common, but the next best match could only achieve 3 skewed matches after estimating the best time skew - easily distinct from the 43 skewed matches found for the true match. As a compromise, however, the -matchwidth option simply widens the tolerance for time-skew-matching in the filtering stages beyond the default 1 bin difference. Increasing -matchwidth to 5 here increases the Filtered count for the correct match to the 1% stretched version to 17 -- still very low, but now clearly differentiated from the next-best match, which still only achieves 3 filtered matches. In v0.88, the -warpmax and -warpstep options were added to help with this case. Setting a nonzero -warpmax will cause the filtering to search a range of time warpings of the retrieved hashes out to +/- warpmax in steps of -warpstep (default 0.001, 1 part in 1000). The filtered hash count is then the max over these warp factors. This option gives the final "Warpmax 0.02" column in the table. Because the filtering is repeated many times, this option slows down matching. At 2% stretch, the true track is only ranked #9 when sorting by raw hash count in this small database; i.e., something like 1% of tracks have more raw matches by chance than the true track, so for any reasonable-sized database, the hash indexing isn't going to find the right track. Thus, a time stretch of around 1% is likely the limit of useful matching for audfprint, even with these extended warp accommodations. All sources are in the package audfprint-v0.9.zip. Feel free to contact me with any problems. The included function audioread is able to read a wide range of sound file types, but relies on a number of other packages and/or support functions being installed. Most obscure of these is ReadSound, a MEX wrapper I wrote for the dpwelib sound file interface. See the audioread homepage for more details. %                     when I switched to 11 kHz sampling rate. %                     matching of warped queries. %                     try to accommodate, but they still persist. % v0.85 2013-07-29  - fixed bug with "rebuilding HashTableLengths". %                     regexp pat ('.' for all). %                     scaling) for the top match. %                     non-default time grid resolution. %                     of hashes recorded per reference track. %                     total number of hashes stored per track. %                     adding empty tracks with -matchonaddthresh . %                     list is truncated to the last non-deleted item. %                     hash (better for interpreting retrieved hashes). %                     to remove contained in a text file. % v0.73 2013-03-13  - added -list 1 option to list files in database. %                     (in ht_save and ht_load, and audfprint.m). %                     HashTableCounts and HashTable before saving (!). %                 same time; it's a hack). %                 match '.' and '..' in Unix. %                 Also added -outdir to write per-query report files. % v0.5 2012-05-14 Added -remove option to remove single tracks. %                 output. Used to truncate at 20mins, now respects -maxdur. %                 best. -nmatch renamed to -matchmaxret. %                 Added detail on report format above. %                 database during long add operations. %                 rate (from 8000); now runs about 4x faster for mp3s. %                 *NB* databases made with v0.0 cannot be used with v0.1.